Hilton has a promotion to celebrate its 50th anniversary of having presence in Japan. You can get 5,000 bonus points per stay between March 28, 2013, and March 31, 2014. The terms and conditions state that you would need to register for this promotion, but that is not the case, as it is tied to a special rate code that you need to book. You must use promotional/offer code PR50A0 at the time of the booking (you can use the regular Hilton website here). This offer was mentioned on one Hilton hotel web page here. Seems that this 5,000 bonus points rate is available at the “Easy Cancellation” rate. Why don’t they just call it a best flexible rate? Not sure how I have managed to miss this offer earlier. But Hilton doesn’t make it easy to find all the offers they have. This is nice 5,000 bonus points for those that book flexible rates. Offer valid for eligible stays completed between March 28, 2013 and March 31, 2014 (“Promotion Period”) at any participating hotel in the Hilton Worldwide portfolio in Japan. 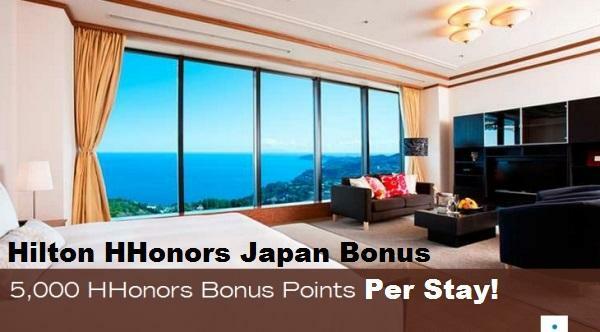 Non-members must first register at http://www.hhonors-japan.jp/ before booking. Registered HHonors members will receive the 5,000 HHonors Bonus Points only for stay completed during the Promotion Period. There is no limit to the total amount of Bonus Points that may be earned during the Promotion Period. Bonus Points do not count toward elite tier qualification. Please allow six to eight weeks from completion of your stay for points to appear in your HHonors account. Offer is not transferable, is not valid for groups and cannot be combined with other select offers. Hilton HHonors™ membership, earning of Points & Miles™ and redemption of points are subject to HHonors Terms and Conditions.